Amber is very happy pup. She always has a big smile for you. She loves to be petted and will thank you with a lot of kisses. 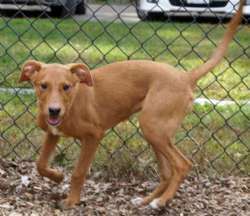 Amber is an 7 month old mixed breed "Island Dog" from St. Thomas. She is friendly and well socialized. She is a very curious girl. Her ears perk up for every stranger she meets. Jacala and Amber came up from St. Thomas together. If you are interested in this sweet girl, please fill out an online application. She will be at out Meet and Greet Oct. 5th-6th 12pm-3pm. She will be spayed prior to adoption. What a sweetheart! Arden was picked up as a stray on 9-19. He is just a great dog, very sweet, and sensitive. He is getting along well with other dogs, where he is also submissive to the others. He walks great on a leash, and loves people! He is also fine with cats. He deserves to be top dog in someone's life! 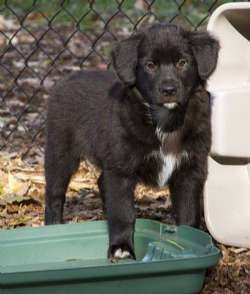 Bentley is a black fluffy male pup who has a little white smudge on his nose. He was shy when he first came to us but he has really come out of his shell and is quite outgoing, following the resident adult dog everywhere he goes. He is house broken! Not one accident in his foster home. That is amazing for a pup this young! He was born on 8/3. He and his litter mates love the water so a home near a body of water would be great or someone who frequents the beach. There are 3 males and 3 females all with different markings. Mama dog is Dixie who is a Collie/Corgi mix. Because he is still very young he will need a stay at home person and families with school-aged children will need to have a physical fence. This pup is worth the effort. What a find! 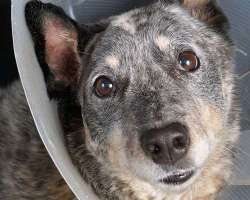 Boca is a 7 year old spayed female Australian Cattle Dog / Blue Heeler mix who is a sweet girl. Boca weighs 45 lbs. This sweet dog has had a rough life so far. Her teeth look like she's been chewing rocks. She was probably tied or chained. She was sitting in an overcrowded shelter in Kentucky. Now she has a chance at adoption. Her hair is very thick and soft. When she first went into the pound she was still friendly and walked well on a leash even though she was frightened. She seems to get along well with other dogs and cats. 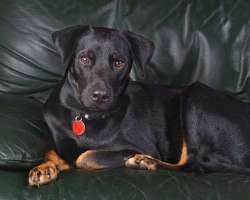 Please welcome this sweet heart of a dog into your life by filling out our online adoption application on our Web site. She is available after 10/8/13. She's going to have a dental to remove a couple of broken teeth and to clean up the rest of her teeth so she'll be ready for adoption. We are asking for donations to help cover the cost of the dental. So far we have raised around $300 of the $850 vet bill. Bonnie is gorgeous dog who needs a new home because her energy level was too much for the elderly couple who got her as a puppy. Bonnie is a sweet dog, weighs around 35 lbs and has typical Border Collie traits. Her ideal adopter should have breed experience. She is so smart and this breed is extremely loyal. She has a high energy level so should have exercise everyday. Bonnie is also very content indoors on a dog bed and will watch what you are doing as she is always ready to help out with any task you have in mind. She is house trained, good with cats and other dogs and loves people. She is very quick so of course would be great on the agility course, typically these dogs love a job to do. She would do very well with another dog that is her size and energy level. She willingly shares her food bowl with all dogs in her foster home. She is a joy to watch as she is "grace in motion" when running and can cut around other dogs before they know she is even there. Bonnie is a little under the weather so will not be available to meet this weekend. Please watch for updated information here. 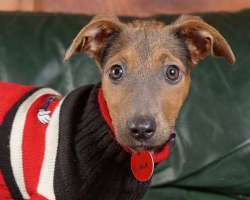 Cookie is a quiet 10 week old puppy from Anguilla. She has liquid brown eyes that will draw you in and you will be totally smitten. She is tiny right now, but is just a pup. We think she will be on the small side when she grows. Her coat is short right now. She appears to have been shaved as she has very short, soft fur that we believe will grow into a nice coat. Her coloring is so unique her body is almost pewter with tricolor head and feet. She is petite and adorable. Please fill out an application on our website if you are interested in meeting her. www.saveadog.org. Georgia is an awesome dog! She is beautiful, confident, happy and completely wonderful! Her pictures do not do her justice. She loves attention from people and is fantastic with dogs of all ages from a 9 week old puppy to a 11 year old grumpy chow mix. No aggression of any kind and is more that willing to share her food with other dogs with no complaints! She is very quiet and only barks when something is close to the house and even then she will be quiet when told to. There are no resident children at her foster home but she has been fine with visiting children. 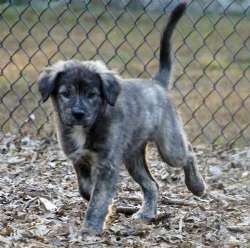 Someone is absolutely going to fall in love with this dog! Can someone please take a chance and adopt or rescue this love of a dog? You will not regret it!!! Approximately 2-3 years and 50 lb. This breed is known as the monkey dog or devil with a mustache and Gidget is truly the comic in the household. She has been in a loving foster home and has definitely won the hearts of everyone with her sweet, playful nature. She can be shy at first but when she warms up to you, she really comes into her own with her comical behavior. She gets along well with other dogs and dog-friendly cats. In the foster home she would be the one to reach out to the new dog and make them feel welcome. She enjoys short walks but doesn’t require a lot of activity. She likes to explore a fenced yard and find a sunny spot, but she doesn’t want to spend a lot of time alone. She wants to be close to her human but is not clingy whatsoever. Gidget has shown her talent as an escape artist. If you have a fenced yard, you will want to make sure she can’t dig her way out. She has done it 3 times here. Because of her quick ways we prefer tweens and up. She will definitely be a delightful addition and bring a lot of joy to that new home. 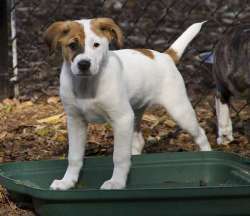 Please fill out an application at www.saveadog.org if you are interested in meeting her. 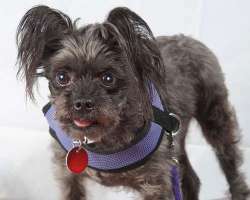 GIDGET WILL BE AT MEET & GREET SUNDAY 27TH 2-3 PM. 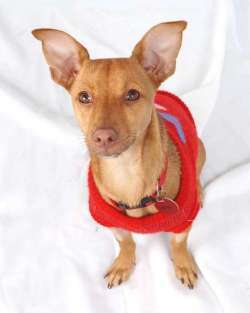 Izzy is a little Island dog from St. Thomas who loves to snuggle up next to you. She will even kiss your cat and dog with enthusiasm. When you hold her she feels just perfect - a warm little bundle of love- and she usually crosses her legs like a lady and will place a paw on your shoulder or chin. Her ears are beautiful and one is usually up and one is down. She has little "walrus" feet that point outwards from her body. She is lively and athletic. She likes her tummy petted. If she wants a treat, she can stand on her back legs for a long, long time (we say she dances). She is such a joy. She may never grow into those ears! Her sister, Tammy, is also available. She will be available to meet at our next Meet & Greet Sept. 28th and 29th. Please apply online if you are interested in meeting her. 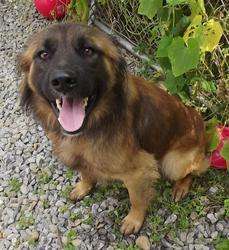 Jacala is an 18 month old mixed breed "Island Dog" from St. Thomas. She is friendly and well socialized. She is a very curious girl. Her ears perk up for every stranger she meets. Jacala and Amber came up from St. Thomas together. If you are interested in this sweet girl, please fill out an online application. She will be spayed prior to adoption. She will be at out Meet and Greet Oct. 5th-6th 12pm-3pm. Jack is a small mix who is gorgeous. He is about a year old, and weighs 10 lbs, but we don't tell him that because he thinks he is a very big boy. 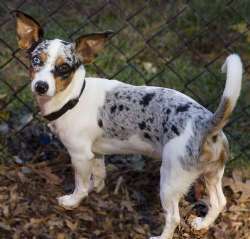 Jack was found as a stray in TN by a wonderful couple that took him in and cared for him. He is now ready to find his forever family. Jack is the life of the party. He was instantly accepted into the group of dogs in his last foster home. He gets along with every dog, cat, and of course people. He is house trained and has just recently figured out the dog door. 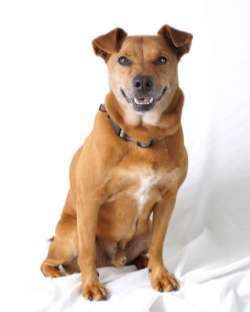 Jack is super social and would be a great addition to a home that has a playful dog. He is so unique looking that he attracts attention wherever he goes. He has one blue eye and one brown, making him very handsome. Give him a chew bone and he will promptly bury it, either inside under blankets or outside. He is very much still a puppy at heart and loves to run and play all day. He loves car rides, and he is very good with children, and loves to snuggle on the couch. He really loves his daily walk on the leash and struts very happily. He knows his name and will come when called, This little guy needs a fenced yard to keep him safe as he loves to chase squirrel's as all JRT's do. He arrives on 10/16/13 and is available on 10/19/13. Jetta is one of six puppies who came in with their Mama. These adorable playful puppies are 11 weeks old this weekend. Dixie, the mom, is pictured here too. She looks like a Pembroke Corgi Mix, but the father must have been larger as these are medium to large sized pups. They love the water so a home near a body of water would be great or someone who frequents the beach. There are 3 males and 3 females all with different markings. They are still very young so will need a stay at home person and families will need to have a physical fence in place in order to adopt. They are too young to be spayed. A group picture is shown under Dixie's Male Puppies. They will be available 10/19. Please fill out an application if you are interested. www.saveadog.org. Two of the females are spoken for, but Shelby, the tan fluffy girl, is available and will be shown today, 10/20, from Noon to 2:30 (we close at 3 PM). Jewel is an adorable Island pup from St. Thomas. She was delivered to a high volume shelter along with her sibling, Zephyr. Both area really sweet puppies who deserves great homes. She is available after 10/8. Please read our Guidelines for Adoption and be someone who has time for a puppy. 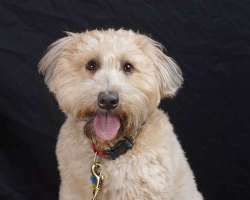 Kelsey is a female Wheaton Terrier who was relinquished by her owner when she became too dominant with their older Wheaton. 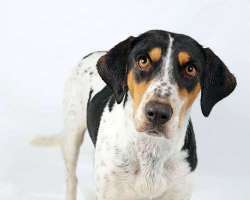 She is a "top dog" with other dogs so would do best as an only dog to begin with, but we are looking for an adopter to properly socialize her with other dogs. She was fine meeting all sizes of dogs through our play yard fences, but our understanding is that she is too dominant in off-leash play. She's extremely affectionate and friendly with people. Kelsey needs an experienced dog person (prefer Wheaton experience) who will take her to reward-based training. She is almost 2 years old and is a beautiful dog with a beautiful coat that has been well-maintained. She will need regular groomings to maintain the healthy coat. Kelsey is spayed and up to date on vaccines and is also trained on invisible fence. She was not raised with children or cats, so she shouldn't live with them, but is friendly and gentle with visiting grandchildren so visiting children would be okay. She likes to play fetch and knows sit, stay, wait, shake, roll over, come, and down. She needs work on her dog issues, so we would require an adopter to work with a professional trainer for that. Kia is one of six puppies who came in with their Mama. These adorable playful puppies are 11 weeks old this weekend. Dixie, the mom, is pictured here too. Mom looks like a Pembroke Corgi Mix, but the father must have been larger as these are medium to large sized pups. They love the water so a home near a body of water would be great or someone who frequents the beach. There are 3 males and 3 females all with different markings. They are still very young so will need a stay at home person and families will need to have a physical fence in place in order to adopt. They are too young to be spayed. A group picture is shown under Dixie's Male Puppies. They will be available 10/19. Please fill out an application if you are interested. www.saveadog.org. Two of the females are spoken for, but Shelby, the tan fluffy girl, is available and will be shown today, 10/20, from Noon to 2:30 (we close at 3 PM). Meet LuLu, a sweet, sweet Shepard mix. She was abandoned and left to fend for herself, luckily she made her way to her wonderful foster family who took her in. LuLu is very energic and always up for play but will settle nicely on your lap too. She loves being with her human friends. She is a bit more timid with men than women but with reassurance she doesn't take long to enjoy a mans company. Lulu is about 4 months old and is full of puppy! Well on her way to house training. She does well with adult cats (kittens are play toys) and other dogs. She is very smart and will do much better with a "job" to keep her entertained. Please fill out an application at www.saveadog.org if you would like to meet her. This litter is arriving on Saturday, 10/26/13 and will be available for our Meet and Greet on Wednesday, 10/30. There are 7 pups: 4 females and 3 males. Maggie, the mother dog, was rescued before she went into the shelter so the puppies were born in a foster home 4 days later. They are all different looking and all have different color fur. They have been handled and loved since they were born. They love people and love attention. They come running to " Puppies, Puppies" . They love to be held and cuddled, and love to have their backs, bellies and necks scratched. They are still typical puppies and will bite, scratch and jump on you so we do not recommend them for young children. They spend their days playing and wrestling with each other and then piling on top of each other for an afternoon nap. 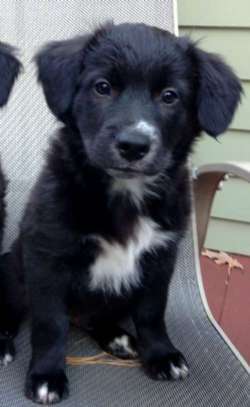 Mojo is an adorable 10 week old Lab mix who has soft fur and is very sweet. His coat coloring is black with a sable sheen. He's from St. Thomas so will be smaller than a Lab although he does possess Lab features. He already likes to do his business outside. He is a quiet pup. He needs a stay-at-home situation and if children, not too young as he is still tiny and could easily be dropped or stepped on. Please see our adoption guidelines and fill out the online application if you are interested in adopting him. Napoleon is a really nice dog, easy going, affectionate and house trained. He's not a barker. He is a true gentleman. He has a lot to offer any family. He's 3 years old so is finished with puppy behaviors. He knows Sit, Stay, Wait, and Paw. He and Rio were surrenders from the same home. They were dropped at an animal clinic by their owners. 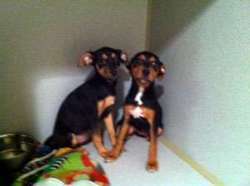 Rio and Neopolitan were already altered and just had heart worm test, rabies and fecals. Napoleon is good with cats. His foster mom says he was excited to get out of the shelter and go to her house, but he calmed down quickly and is chilling with the other dog and the cats. He's an easy keeper! Available to meet on weekends at our shelter, from 12-3 PM. 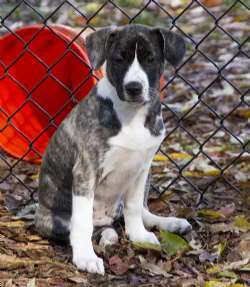 Pepper is a short-haired female puppy who loves to play. This litter of mixed breed pups will be available for our Meet and Greet on Wednesday, 10/30. They were born on August 11, 2013. There are 7 pups: 4 females and 3 males. Maggie, the mother dog, was rescued before she went into the shelter so the puppies were born in a foster home 4 days later. They are all different looking and all have different color fur. They have been handled and loved since they were born. They love people and love attention. They come running to " Puppies, Puppies" . They love to be held and cuddled, and love to have their backs, bellies and necks scratched. They are still typical puppies and will bite, scratch and jump on you so we do not recommend them for young children. They spend their days playing and wrestling with each other and then piling on top of each other for an afternoon nap. 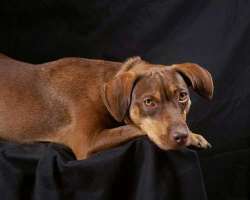 Princess is a 1.5 year old Retriever mix who is available for adoption. She's good with kids and dogs and we expect she will be gentle with cats, but we haven't tested her yet. She was rescued along with Toby in Anguilla. Princess (female) and Toby (male) are affectionate dogs who love their people. They love cuddling and playing alike and have been together their whole lives. When the shelter they were at became full, they were about to be put to sleep when volunteers sprung into action and held a fund raiser to sponsor their flight to the U.S. and ultimately to Save A Dog. They have finally arrived and their journey is almost complete. The only thing missing is a permanent home for each. It is not a requirement for them to be adopted together but I do think they would enjoy have a canine playmate, since they are used to having a friend all the time. So if the family has another dog that fits well with them, that would be nice. They are house broken and love the car. Since they have been together and with a stay at home foster we would like for their new families to have someone home a good bit of the day to avoid issues with separation. Available after health exam on 10/2. Ranger is all black boy (no smudge on nose). He is a happy active boy. Plenty of energy - loves to play. Loves his people and is always ready for their attention. Loves to play with the foster family’s young pup. These adorable playful puppies are 11 weeks old on Sat, 10/19. They love the water so a home near a body of water would be great or someone who frequents the beach. There are 3 males and 3 females all with different markings. They are still very young so will need a stay at home person and families will need to have a physical fence in place in order to adopt. 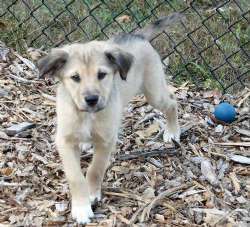 Reeses is an adorably playful and friendly female mixed breed. She is about a year old. She is very petite, around 25 lbs, and is much smaller than she appears in pictures. She just loves to play. She will chase a ball or toss a toy in the air to entertain herself. She tested very light heart worm positive, but further tests showed she has no microfalaria and no adult worms show, so she might have had one adult worm. We are using the slow kill method to treat her and are looking for a holistic-minded adopter to work with us for her. She would be best in a fenced in yard. She rides great in the car and is just a delightful young dog who will flourish with training. She is a bit too interested in cats so a no cat home is needed. She is house broken and crate trained. Reeses loves men and loves to be a cuddley lap dog after a bit of outdoor play. She has a lot to offer and will bring you a lot of joy and laughter. Please apply online. Reeses will be at our Meet and Greet on Sunday only. Rio will steal your heart! 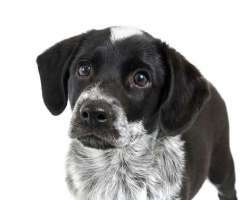 This charming little Jack Russell loves to have lap time and give kisses. She plays nicely with her ball with and can even entertain herself. Rio is not a high energy Jack Russell. She has a calm disposition. Rio loves people and would like a part time worker to be able to have time with you. Please fill out an application on our website if you would like to meet her. www.saveadog.org. Terrier experience is a plus for this adorable little girl. 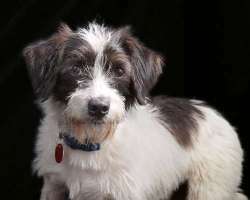 Russ is a little guy who was picked up as a stray in rural Kentucky on September 19. Shortly after arriving at the Pound, he was attacked by a larger dog and injured. Russ had his front leg sewn up and other punctures treated. He was also neutered at same time. He is doing well now. This cute guy has no issues with other dogs, but can be a bit timid especially after what he had been through. Whoever owned him previously had very tight collar around his neck that left quite an impression.This little guy deserves a loving home. We don't know if he was raised with children, so no kids is best. We would like a fenced yard as he is could escape easily from a home and we want him to be able to enjoy the outdoors safely. Shelby is one of six puppies who came in with their Mama. These adorable playful puppies are 11 weeks old this weekend. Dixie, the mom, is coming soon. Mama looks like a Pembroke Corgi Mix, but the father must have been larger as these are medium to large sized pups. They love the water so a home near a body of water would be great or someone who frequents the beach. There are 3 males and 3 females all with different markings. They are still very young so will need a stay at home person and families will need to have a physical fence in place in order to adopt. They are too young to be spayed. She is playful with the other dogs and very submissive. She is curious and is the first to settle down. She likes to chew on a bone and will keep herself busy with that. She’s a good puppy. They will be available 10/19. Please fill out an application if you are interested. www.saveadog.org. Two of the females are spoken for, but Shelby, the tan fluffy girl, is available and will be shown today, 10/20, from Noon to 2:30 (we close at 3 PM). Smoochie is a gorgeously big Beagle boy. He will totally steal your heart with his personality. He is SUPER AFFECTIONATE and if you let him, he will give you a hug and stay there forever getting pets. If he sees another dog in the other yard, he will run around doing figure 8's to get the dog's attention. 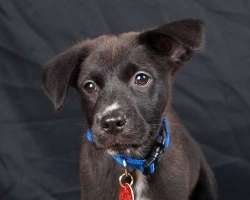 It would be fabulous if he had playmates as he is so well socialized and just loves to play. He would be a great dog for kids. He is purebred Beagle and is very quiet, doesn't make a sound. He has the heavy bone structure of a Basset. You would think he was a Basset mix. His breeder raised him for field trials, but he was too big to qualify so he gets to be a wonderful companion dog for someone. He's a sweet boy who will need some training. He is neutered. You can see his mother, Ebony, on our Recently Adopted web page. 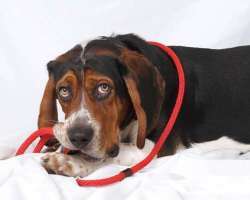 Smoochie is a very comical dog who will keep you laughing for days at a time. He does so many funny things. He's a sweet dog, submissive with other dogs and gentle with kids. He is available now. ADOPTED! Tacoma is the striped fluffy male. He is playful with other dogs, of all sizes. He’s not afraid of big dogs. He likes to be petted and doesn’t mind being held. He was born on 8/3 so just turned 11 weeks old this weekend. He and his litter mates love the water so a home near a body of water would be great or someone who frequents the beach. There are 3 males and 3 females all with different markings. They are still very young so will need a stay at home person and families will need to have a physical fence in place in order to adopt. Tammy is a lively girl! She likes chasing after our other pets and rolling around. Her distinction is that she can stand on her back legs for a long, long time - and we say she is quite the dancer. She has beautiful odd shaped ears and the graceful figure of a greyhound. She loves to give kisses and loves being held. She likes nothing better than to be right next to you, preferably where she can feel you breathing. She gets comfort from humans and loves it when you arrive home. She is a lively and kind-spirited girl! She will kiss your cats and dogs! Her sister, Izzy, is also available. She will be available to meet at our next Meet & Greet Sept. 28th & 29th. Please apply online if you are interested in meeting her. 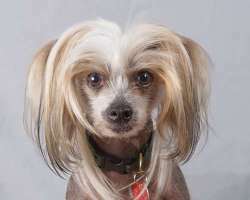 Tiffany is a beautiful 5 year old Chinese Crested who loves everyone (a real cuddler) and is really meant to be a lap dog with her very own family. She has the nickname “Tiffy two-balls” as she carries around a small ball while playing soccer with another. She enjoys playing fetch in the fenced yard, and is the fastest runner in the household. She loves to go for walks and meeting new people. She does get along with other dogs and cats, but given her personality, would do better as the sole “love” of an adopter’s life! Tiffany is a delight to be around, is very playful and social, and most of all wants to be the center of someone’s world. We prefer tweens and up. The adopter should be knowledgeable about the special requirements of the hairless breed, but she is a hairy hairless so the hair will grow out if you want. She is comfortable in the Crested cut and doesn't mind being dressed up in various outfits. She's completely house trained and very smart. 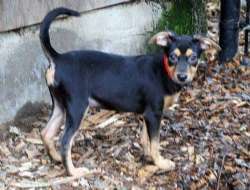 Please fill out an application at www.saveadog.org if you are interested in meeting her. She is available by appointment during the week. 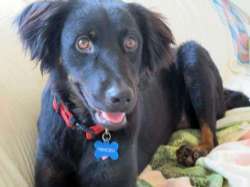 Toby is a 1.5 year old GORGEOUS Retriever mix who is available for adoption. Toby has Lab exuberance so would be too much for small children, but teens and up would have a lot of fun with him. He also is great with other dogs. Toby is an affectionate dog who loves people. He loves cuddling and playing alike. When the shelter he was about to be put to sleep when volunteers sprung into action and held a fund raiser to sponsor his flight to the U.S. and ultimately to Save A Dog. They have finally arrived and their journey is almost complete. The only thing missing is a permanent home. So if the family has another dog that fits well with him, that would be nice. He is house broken and loves the car. He was not interested in cats but we are uncertain how he would be in a home with cats. Zephyr is an adorable Island pup from St. Thomas. She was delivered to a high volume shelter along with her sibling, Jewel. Both area really sweet puppies who deserves great homes. She is available after 10/8. Please read our Guidelines for Adoption and be someone who has time for a puppy.